On the occasion of the 80th birthday of the Dalai Lama, three former Indian foreign secretaries referred to the importance that the spiritual leader has for his people, despite his long exile. They described His Holiness as a symbol of universal brotherhood and referred to him as the real pillar of the Tibetan people, which account for more than 6 million people living in China alone. Three former Indian foreign secretaries, one of whom was also the National Security Advisor, and a former union minister came together on stage on Saturday [4 July 2015] here to pay warm tributes to the Dalai Lama on the occasion of his 80th birthday. Former foreign secretaries Shyam Saran, Lalit Mansingh and Shivshankar Menon, who is also a former NSA, and former union minister Arun Shourie shared anecdotes from their many interactions with the Tibetan spiritual leader, highlighting his great sense of humour and his humaneness, at a talk at the India International Centre. "We are singularly fortunate that he has chosen our country as his home. We take this as a blessing. The Dalai Lama is a living symbol of universal brotherhood," said Shyam Saran, who was moderating a panel discussion on "His holiness the Dalai Lama and his contribution to humanity". Saran said the Dalai Lama -- whose birthday is on July 6 -- "has become one of us", and while he represents the ancient heritage of Tibet, the spiritual leader has "always said he is only bringing back to India what India has given (Buddhism)". "He has rekindled the spirituality that is in our heritage," said Saran, adding that the Dalai Lama always "puts across his message with humour; he is always in a good mood". Lalit Mansingh said that among the Dalai Lama's missions was to promote human values in the world so that people can live a better life; as a Buddhist leader promote the message of the Buddha of non-violence and peace; and as the Dalai Lama, be the spiritual leader of six million Tibetans living in China, "whose culture and human rights continue to be denied under a brutal regime". Mansingh said the Dalai Lama "is the face of Tibet and the international face of the tragedy of Tibet". Shyam Saran recounted the Dalai Lama telling him how he had escaped from Lhasa on horseback in 1959, praying all the while that the tinkling of the horse bells should not be heard by the searching Peoples' Liberation Army. When he crossed into India, it was Shivshankar Menon's father P.N. Menon, a diplomat, who received him. Shivshankar Menon said the Chinese media had run a story then headlined "Menon kidnaps Dalai Lama". Menon said the Dalai Lama was a "true example of a leader" who despite having no government of his own, and being a refugee, has profound global influence. He said the Dalai Lama has steadfast belief in peace and non-violence "even in the face of the suffering of his people". Shourie said the Dalai Lama was an "exemplar of converting the great suffering of his people into benediction". He said the spiritual leader always maintains that he is bringing back to India its own tradition (Buddhism), which Shourie said was almost forgotten in India. "Because of Chinese oppression he was able to spread the fragrance of a tradition all over the world," he said. Shourie said the Tibetan refugees were a happy and cheerful people because of the Dalai Lama "sustaining hope". 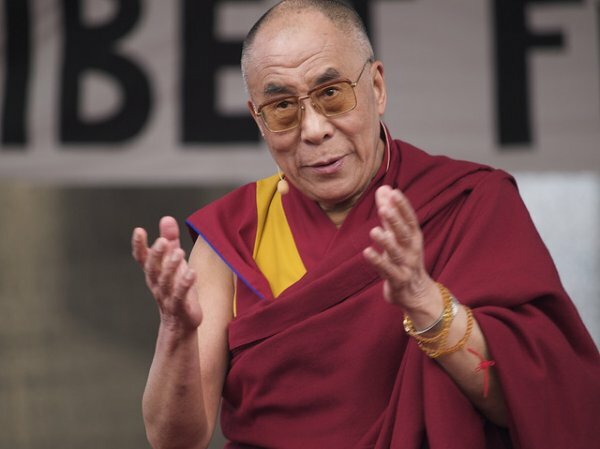 Shourie said the "oppression of two lakh Tibetans in exile has become a cause for the world because of the Dalai Lama. He has made Tibet's cause everyone's cause. He has shown how by goodness it can be made the cause of the world. He (Dalai Lama) gets into our hearts as if he is one of us. His life is one great teaching". Shyam Saran said of the Dalai Lama: "Greatness sits lightly on his shoulders."